The 1970 Ford Mustang Boss 429 is no less than a full-on race car that was made to be legal on the street. With its new styling update from the 1969 Boss 429, the 1970 Mustang Boss has become one of the most sought after and expensive used pony cars in automotive history. But.. If the original Boss Mustangs hit the streets before you were born or you were too young to ever hope to own one at the time, you may be wondering why were these cars then and why are they now, considered so important that they continue to be worth huge sums of money restored or not. And why so significant, that Ford made the decision to bring them back as part of the 2012 Ford Mustang offerings. Prices at the Barrett Jackson auctions regularly see these cars sell for amounts well in excess of $ 100,000. In fact, the fully restored white 1970 Ford Mustang Boss 429 below,with 219 original miles sold for an amazing $258,500. The car was raced (as many Bosses were) during the 1970 race season and then spent the next 37 years on a flat deck trailer, before it was sold in 2007 and restored to factory new condition. What Makes a 1970 Boss 429 Special ? 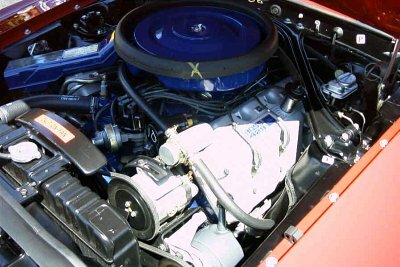 The Big 429 cubic inch V8 was not just a re-purposed 429 out of a truck or police car. Ford was looking to dominate at NASCAR and needed an engine capable of beating Chyrsler's world beating 426 hemi. And what it came up with, was a brand new 429 cubic inch "semi-hemi" engine, purpose built to thrive under racing conditions. But to be eligible for "homologation" as a street production V8, they needed over 1,000 of these race ready engines in street vehicles. This was no small task, making a race engine live in day to day, low rpm, light to light driving and pass the increasingly stringent emission laws imposed by the US government. Although the engine was rated at a measly 375 horsepower, actual power was much higher. And that was just the beginning. To meet US EPA pollution guidelines, the engines had to be seriously de-tuned in street form. While in race trim, they sported a solid lifter race cam, huge carburetor and tunnel ram manifold, the street cars used a low revving hydraulic cam (early production models), and ridiculously small single carburetors. 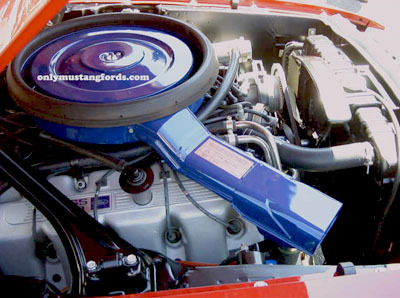 Originally christened, the blue crescent engine, the 1970 Ford Mustang Boss 429 engine became widely known in racing circles as the "Shotgun". That's because it's intake and exhaust ports were so large at 2.3 inches, that they could just about swallow a tennis ball! They were actually the largest valves ever put into a Ford production engine. 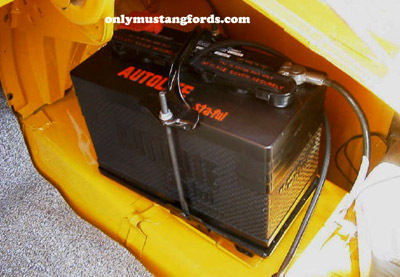 Like it's smaller cousin, the Boss 302, the battery of the 1970 Ford Mustang Boss 429 was relocated into the trunk, to improve the front to rear weight ratio, which helped to improve handling and braking. Unfortunately as a result of all that detuning, in stock form on the street, the cars performed little better than the street trim 428 Cobra Jet Cars and were barely faster than the small block Boss 302's which also handled much better. So mid production, Ford switched back to a solid lifter cam and tuning, as well as replacing the superior, but heavier NASCAR connecting rods with lightened versions, to help the engine build revs faster. Racers and hot rodders, however, were not fooled by the numbers, nor held back by the street tune. Secure in the knowledge that those high nickel blocks, NASCAR strong connecting rods, superior dry sump oiling and baskets full of Holman Moody race parts would take the punishment, these machines were easily brought up to race specifications and horsepower. On the race track, where they were designed to perform, they did just that, obliterating their competition in the 1969 NASCAR circuit. Other "production" cars found their way to the drag strips, some with big 6-71 superchargers strapped to them, cranking out over 1,200 horsepower! To accommodate the significantly wider engine (some 2 inches wider than the 428 CJ), Kar Kraft had to redesign and move the upper shock towers outward, as well as redesign the lower mounting pieces. In conjunction with other rear suspension modifications, Kar Kraft added special spindles and control arms, resulting in the necessary wider track and an approximately 1" overall lowering of the car's ride height. To accommodate the tires into the wheel wells, with the widened front suspension, the front fenders had to have the lips of the wheel openings rolled to improve clearance between the tires and sheet metal. Only five colors were available for the 429 homologation special, consisting of Grabber Orange, Grabber Blue, Grabber Green, Pastel Blue and Calypso Coral. Interior choices were limited to only Black and White Vinyl coverings. Ok. Hold your breath.... the original list price of a 1970 Ford Mustang Boss 429 was $ 3,979.00. No I didn't misplace the zeros. That's only $700 more than a new Mach 1 cost. Now you'd need to move that decimal almost three points to the right for a cherry example. So what to do if you can't justify living in a car instead of a house? While some of these 1970 Boss 429 clones are little more than a stock sportsroof car with stripes and a black hood scoop, many are painstakingly built to recreate the original cars, with proper widened front suspensions and all the right parts from the rear suspension, to stickers, chalk marks and overspray. Some purists will insist that any Mustang Boss clones should not be recognized or tolerated, those of us who will never have the chance to own, or maybe even see a real one, still can appreciate these tributes to an amazing car and have a chance to own a piece of the legend at a price that is at least within the reach of someone with an income considerably lower than collectors like Jay Leno.